Sam Adams had enough on his hands in day-to-day colonial America, and with the prospect of a revolution, he had a pretty full plate. Luckily he knew a certain silversmith who had the tools to get the job done. He may not be a silversmith, but you kiddo is a major history buff--it’s by far his favorite school subject. 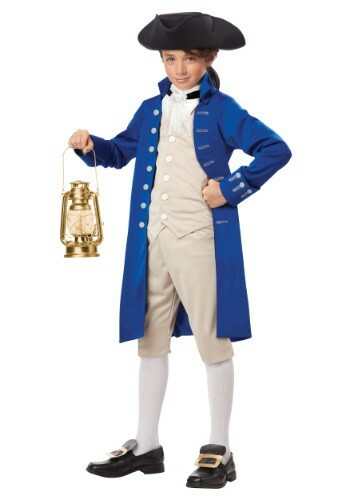 So if he’s starting to think that there's a revolution brewing--or if he just likes to be the first to know everything--he'll have a great time in this Child Paul Revere Costume. With this perfected period look, your “son of liberty” won't have any problem signaling that the British are coming and saving everyone from harm. He’ll be so stately, strutting around your abode and proclaiming left and right, riding his “horse” with the wind through the backyard, sending signals by flashlight to his best bud across the street--one blink if they’ll meet at the park tomorrow (land); two blinks if they’ll meet at the pool (sea). He’s clever, your little patriot.